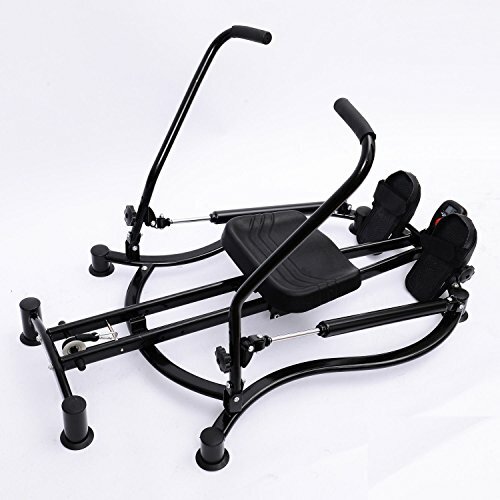 Get a complete full body workout in the comfort of your own home with this Soozier glide rower machine. This machine is compact to save room and lightweight so you can break it out anytime you wish to use it. It provides a low impact way to work large muscle groups such as your back, legs, arms and abs while you enjoy a great cardiovascular burn as well. Complete with adjustable hydraulic resistance arms that you can increase or decrease, you are able to change up your workout to train for distance or power as you see fit. This durable and sturdy rowing machine is perfect for an at home gym where you can get fit without having to wait for other people. Change up your routine today and get the best results with the Soozier glide rower exercise machine. - Max. Height of user: 78"
- Min. Height of user: 58"